The Pentagon is in a terrible marriage. The horrible relationship has been allowed to go on for over twenty years. Countless support groups have been called in for the entirety of the marriage, just to see if the Pentagon can make things work. Instead, they only made things worst. For the Pentagon, their commitment to the F-35 JSF has been nothing short of a terrible marriage that is now costing the American taxpayer dearly, not just in terms of money, but also in terms of actual defense. This has all been made worst, seeing as there is a more stable and reliable partner in the background: the F-22 Raptor. But, the Pentagon continues with its blind commitment to a wholly undeserving partner. Left: the F-22 Raptor. Right: the F-35 JSF. We’ve got enough of the latter. Let’s invest in beefing up the numbers of the former, as the F-22 will be the thing that keeps Russian and Chinese fighters at bay. Now, the time has come for the Pentagon to fully divorce itself from its hapless F-35 spouse and move on to a better, more stable, more promising relationship with its oft-neglected F-22 mistress. The divide over how to create the next great warplane began when the U.S. was interested in creating a fighter that could outcompete a Soviet warplane in a dogfight. The F-22 Raptor was the result of that interest. Yet, by the time the F-22 was ready for deployment, the Berlin Wall had fallen, the Cold War had ended, and the United States was the unquestioned global hegemon. NATO forces in Kosovo, this was not the kind of operation that the Pentagon planners envisioned when they paid for the F-22. As time progressed, despite dreams of history having ended with the Cold War, the United States found itself increasingly involved in military engagements throughout the world. These engagements were seemingly endless peacekeeping missions that usually saw the hyper-advanced U.S. military going up against technologically inferior Rogue States, such as Serbia or Iraq, and non-state actors, such as al Qaeda. As such, the kind of capabilities that the F-22 offered were not valued as highly as they once were. Besides, what the U.S. military really needed was a fighter that could stealthily penetrate an adversary’s air defense systems and strike at ground-based targets before anyone even knew that they were there. The F-22 was not designed for such a mission. Thus, the F-35 Joint Strike Fighter came into fruition, even as the Pentagon was still very much enamored by the F-22. “It was partly cultural lag. There was this fear of the Soviet Union. And there was a real military problem. This is a plane [the F-22] that has never fired a shot in anger and never will, almost certainly.” – Former Representative Barney Frank (D-MA) on why he supported the cutting of funding for the F-22 program. Former Congressman Barney Frank (D-MA), sporting a beard and glasses, was one of the leading voices on the Hill in 2009 who supported defunding the F-22. Thanks to his shortsightedness, America will be paying for such a mistake. The need for a plane specializing in ground attack over maintaining air superiority explains why, in the aftermath of the 2008 Great Recession and the subsequent budgetary battles that resulted in Sequestration, Democrats on the Hill and former Secretary of Defense Robert Gates agreed to stop funding the production of more F-22 Raptors and focus exclusively on building a fleet of F-35 Joint Strike Fighters. “With regard to something like the F-22–regardless of whether the number of aircraft is 12 or 200–if we can’t bring ourselves to make this tough but straightforward decision, reflecting the judgement of two very different presidents [George W. Bush and Barack Obama], two secretaries of defense [Rumsfeld and Gates], and two chairmen of the Joint Chiefs of Staff, and the current Secretary and Chief of Staff for the Air Force, where do we draw the line? And if not now, when? If we can’t get this right, what on Earth can we get right?” – Former Secretary of Defense Robert Gates in 2009, announcing his decision to terminate funding for the F-22. President Barack Obama and Former Secretary of Defense Robert Gates discussing the termination of funding for the F-22 Raptor in 2009. This was a very poor choice. Gates and Obama got it wrong. While not designed to perform the tasks that the F-35 was supposed to perform, the F-22 is a quantifiably better aircraft than its F-35 counterpart. What’s more, without the air superiority that the F-22 provides, the F-35 would be useless. The F-22 provides support and cover for the F-35, A-10 Warthog, and a litany of other aircraft that are designed expressly for attacking the ground. As such, the F-35 cannot dogfight well. The strategic environment that prompted the decision to focus on the F-35 has changed immeasurably. First of all, the F-35 is not as original or innovative as was previously thought. Recently, the Chinese have revealed their own version of the warplane, the J-31 (after having stolen the schematics from supposedly secure Pentagon servers). What’s more, the Russians have produced a comparable plane, the Su-35. But, there is little more than 100 F-22s in existence with no new ones slated for production. The F-35s may be decent ground attack warplanes, but their need for defense from the air, coupled with the fact that America is under threat from the Russians, Chinese, Iranians, and North Koreans in Europe, Asia, and the Mideast, means that slightly more than 100 F-22s is not a workable amount. Under such conditions, there will always be a theater of American military operations that will have a dearth of F-22s. The F-22 is expensive. But so too is the F-35 (though it is technically cheaper, at face value). This is one main reason why the F-35 is preferred by the Washington policymakers over the F-22 (though there are certainly many more, less than sensible reasons). To offset the exorbitant costs of the F-35, the Pentagon got 11 allied states to sign on to assist with the production of the warplanes. In exchange, the foreign militaries would come to exclusively use the F-35, thereby increasing interoperability with American forces. The Pentagon also insisted that the Navy and Marines join the Air Force in purchasing variants of the F-35. We’ve got 99 problems and they’re all about the F-35 not working as advertised. Such moves would help to cut down on the cost of the warplane. But, the F-35 program has been an unmitigated disaster for the U.S. military. The various design flaws and delays have only compounded the costs of the purportedly cheaper F-35. Furthermore, creating a one-size-fits-all fighter for our military and our allies to rely on makes for an extreme vulnerability. Right now, each time the F-35 was grounded, both the U.S. military and our allies could rely on other fighters, like the F-16 to pick up the slack. But, by the middle of the century, when all of our F-16s and other fourth generation planes are retired, and we are totally dependent on the F-35, what do we do when the entire fleet has to be grounded due to a design flaw or catastrophic software glitch? God help us all should such an event arise. These are the F/A-18 Hornets that the U.S. Marines are having to rely on since the F-35 is not reliable enough for the USMC to depend on. The planes pictured here have been sitting in the Mojave Desert for years, in the “boneyard,” where the military stores old fighters to be used in only the most dire of national emergencies. Indeed, the United States Marines–in dire need of a new warplane with vertical lift capabilities (VTOL)–were the loudest proponents of the warplane. Yet, the delays surrounding the F-35 have been so bad that the Marines had to turn to the boneyard to keep their fleets of existing, rapidly aging, fourth generation fighters (like the F/A-18) operating beyond their designed lifespan. This is thanks to the undependability of the F-35. Just look at the F-35 glitch list, it is truly historic. The F-35 will prove useless in a global environment where the U.S. must constantly compete with Russian and Chinese elements (since we are at the dawn of the age of tripolar politics) for maintaining air supremacy. After all, who cares how well the F-35 can bomb enemy troops on the ground if they’re being picked off by Chinese J-31 and Russian Su-35 fighters in the air? The F-35 has proven more trouble and more expensive than it is worth. This is particularly true the more that stealth technology becomes less of an advantage (we need hypersonic), as more states gain access to stealth technology, and to the means for overcoming stealth technology. 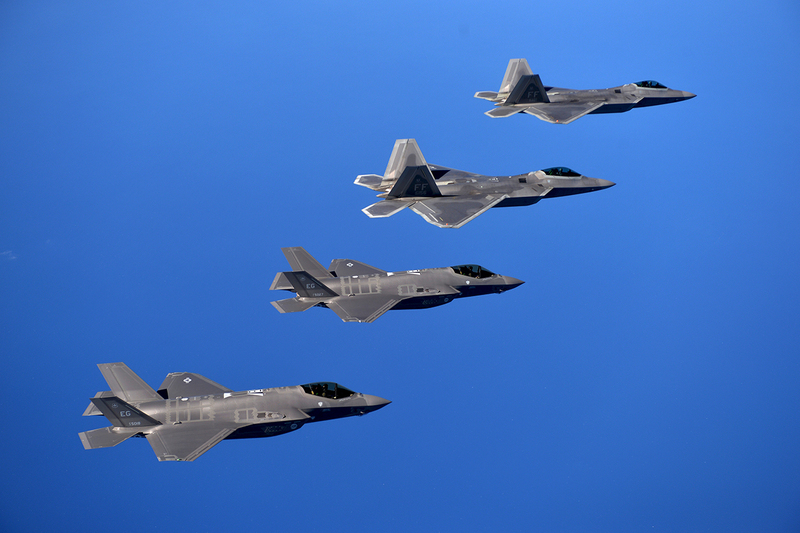 What the U.S. should do is look to rapidly expanding their fleet of F-22 Raptors. Try to Fight Tomorrow’s Wars With Strategic Choices, Please. The wars of tomorrow are not going to look like the wars of the 1990’s and early 2000’s. They will be fought against near-peer competitors. As such, our bombers will need protection in the form of air superiority warplanes. The F-22 represents such protection. An F-16 drops bombs on a target during the Global War on Terror. Besides, the notion that the F-22’s are incapable of performing the role of a bomber as the F-35’s can do is a bit absurd, wouldn’t you say? After all, the F-16–one of the most successful warplanes in American history–was specifically designed for air-to-air combat, just as their F-22 successors were, and yet, the F-16’s have probably had far more experience conducting ground attacks than they ever have in dogfighting. In the coming Trump Administration, a choice will have to be made: does the Pentagon continue to blow its budget on hopelessly ineffective programs, like the F-35, or will the Pentagon start minding its dollars and cents? Will it start supporting projects that are strategically sound rather than technologically fanciful? The decision should be made to restart full production of the F-22 Raptors and to discontinue the Pentagon’s commitment to the F-35. It is heartening Congress has already looked at reopening the production line for the F-22. Recently, President-elect Trump stated his discontent with the cost overruns involved with the F-35. This is a vital first step toward breaking the Defense Department of its mindless, twenty year commitment to the F-35. The tweet that may have finally killed the F-35 boondoggle. If selected branches, notably the Marine Corps, want the aircraft. Fine. They should have exclusive priority over that craft. This is partly because the Marine air fleet is nowhere near as expensive as the USAF’s or Navy’s. Also, because the Marines have a knack for turning previously-thought unworkable aircraft into excellent warplanes (i.e. the V-22 Osprey). But, as a general rule-particularly in the case of the USAF–the primary warplane should be the F-22. Why are America’s policymakers so keen on placing all of our strategic eggs in one airpower basket? Washington needs to stop trying to craft one-size-fits-all gloves for any problem it seeks to remedy. Sometimes, diversity is a really good thing. Having a diverse fighter fleet isn’t just sensible, but it’s strategic. When one model has to be grounded, the other aircraft in the fleet can make up for the momentary loss. If the F-35 were the ubiquitous fighter that the Pentagon dreams it to become, the U.S. would be unable to conduct missions globally if any more problems arose. It is time for the Pentagon to file for divorce from the F-35 and embrace its long-time mistress, the F-22.